As the leaves turn and the weather gets cooler, we begin to put away our cold lemonade and replace it with hot coco and pumpkin flavored sweets. And with fall comes the start of the holidays. Don't fret. There's still time to relax before family and friends arrive. In fact, now is a great time to rethink your kitchen before you welcome guests into your home. Whether your kitchen lacks space or style, we've gathered 5 projects to show you how to get the most out of your kitchen using wooden crates. A kitchen island can give you the extra food prep space that your kitchen may currently lack. Build a simple frame out of plywood and repurpose crates as drawers. Add casters so you can easily tuck the island away when guest are mingling in the kitchen or keep it out for buffet style gatherings. Visit our Projects Page for instructions on how to build this crate kitchen island. Having vegetables out in the open can add warmth to your kitchen without costing a fortune, and you can paint or stain the crate to match any decor. Keeping your produce within reach will also help minimize the mess during the bustle of holiday cooking. Visit our Projects Page for instructions. If you don't have space to serve cocktails, this crate bar, which also functions as a bookshelf, will be your best friend. Stack crates horizontally and wrap them in reclaimed pallet wood to create a rustic bar that is perfect for entertaining in small spaces. Use our removable X-divided insert to easily store favorite wines on the bottom shelf. You can also add casters and move the bar into another room to get people out of the kitchen while you are still cooking. Visit our Projects Page for instructions. The key to keeping your kitchen in tiptop shape during the holidays is to establish an organizational system. Designate a spot for everything. This may sound over-the-top, but organizing with crates is an easy way to keep track of what you have and what you need. Not to mention, using wooden crates will add a warmth and rustic feel to your kitchen. Visit our Projects Page for instructions on how to build this crate pantry cabinet by Sawdust to Stitches. Open up your kitchen by replacing a few cabinets with open shelving. If you're not into using power tools to install shelves, the look is easily achievable with crates. Paint or stain crates to match your style and stack horizontally for an airy feel. Find out where to purchase our Divided Crate. You've probably noticed the growing trend of using crates and pallets in home and wedding decor. Yet, one industry trend in particular is changing the way we think of using old wood crates and pallets. With the simple and functional design, we are seeing crates and pallets more and more used in retail display and store merchandising. One of the best things about using crates and pallets, aside from their durability and weight capacity, is that they easily blend well with any pre-existing decor. Paint, stain, connect, hang or stack them, the possibilities are endless. 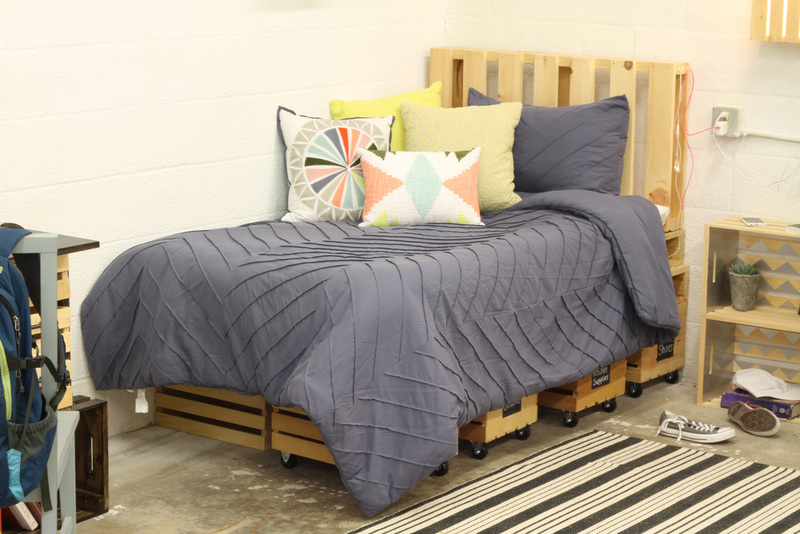 We've broken down eight ideas on how you can use crates and pallets in your store. There are many innovative ways to display and decorate in retail stores using the very on-trend wooden crates and pallets look. For example, you can create a customizable bookcase-type display to the dimensions that are best for your store using Crates & Pallet large crates. 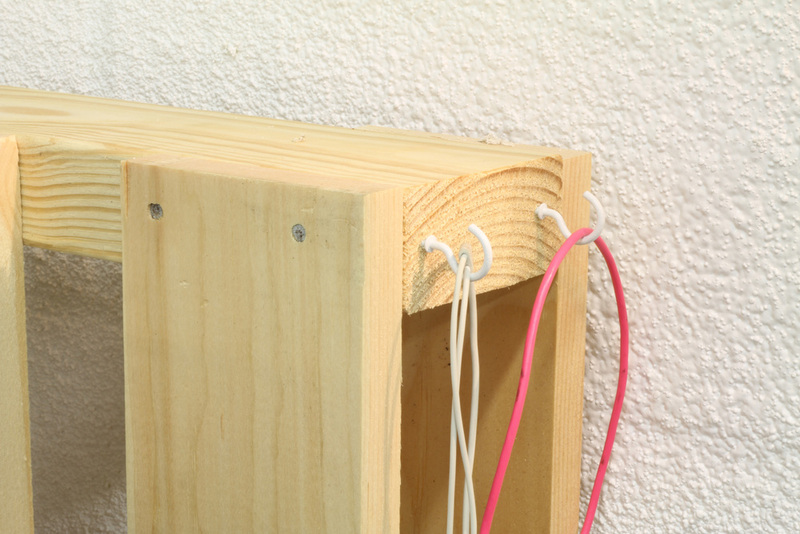 If you turn them on their sides and stack them, you can attach them to each other vertically with ½” wood screws through the slats and horizontally with 1-1/2” wood screws through the solid ends. For a rustic look, add reclaimed wood to the sides or bottoms and use castors with locks for an easy-to-move display. Adding castors to the bottom of a single large wood crate is also great for storing and hiding extra inventory that can be easily moved for re-stocking. Easily create more space in the store with crate wall shelving in three different looks. One way is by installing the bottom of the wood crates directly to the wall. Be sure to use drywall anchors and screws when installing the crates to the wall to insure the crate shelves hold the weight of the merchandise displayed. You can use different size crates to create visual interest and accommodate various sizes of products. A second way for a more industrial look is by making crate shelf brackets out of plumbing pipe, elbows, and flanges found at the local hardware store. The backs of the crates will still need to be mounted to the wall for stability, but the plumbing pipe brackets can be added below for additional support. The third option is to use decorative shelf brackets beneath the crate installed to the wall for added support and a more polished appearance. Hang crates from the ceiling with rope, chain or cable at varying heights for a unique visual display at customer waist or eye level. Simply drill holes in each corner of the solid sides of the crate, attach hanging medium of choice, and hang from a solid support structure in the ceiling. The half and quarter pallets make great vertical displays against a wall or varying height floor displays when stacked. Hang blankets, scarves and belts for display over the slats of a vertical half pallet against a wall, or jewelry and towels over the slats of a vertical quarter pallet. Stack several half pallets on the floor and add several quarter pallets on top for a stepped floor display in order to showcase merchandise on varying levels. Or, simply add castors to the bottom of the half or quarter pallet to store merchandise in the stockroom and easily move inventory around. Use the Crates and Pallet 3-tiered crate stands in either a small or large size, or several of the vegetable crates, to separate merchandise by color, flavor or size. A small 3-tiered crate stand is perfect by a register for a last minute add-on sale. These vertical designs also help merchandise a variety of products while saving counter and floor space. Smaller craft pallets and wooden risers make an impressive, on-trend addition to retail displays using the slatted wood crate look. The craft pallets could even be hung on the wall to display jewelry, scarves, belts, or tea towels through the slats. Sometimes color can emphasize your brand and add appeal in decorating, so you can paint or stain the crates and pallets to match your store’s décor. For a more finished look, lightly sand the wood before applying the paint or stain. If painting, spray paints are easier to use on these products in order to get to all sides of the crate slats. The Rustoleum Paint and Primer in One Spray Paints with the Universal Sprayer are particularly useful because they allow the paint to be sprayed at any angle. For a more rustic or weathered-look, try staining with the Varathane brand of stains in Kona, Weathered Gray, Sun Bleached, or Antique White. The stain can be found at Home Depot or homedepot.com. Using sandpaper, slightly remove some of the paint or stain from corners and edges for an even more rustic look. Crates and pallets can also be used to create economical store or back office furniture. A large crate fits a standard size hanging folder just right, so they make a unique filing cabinet option. Large crates also make interesting desks, and the half and quarter pallets even make a wonderful conversation-piece table. Have you seen any C&P retail displays that really caught your eye? Tag us @cratesandpallet on Facebook and Instagram. We hope to continue to see the trend grow! Founded in 1979, Food Lifeline is a nonprofit organization that comes up with creative solutions to stopping hunger including redirecting good food from manufacturers, farmers, grocery stores and restaurants that might otherwise go to waste. According to Food Lifeline, they believe hunger is a logistics problem; 40% of the food industry's surpluses is still good food but it often goes to waste. Food Lifeline connects this surplus of food to their network of food programs. In their new office in Seattle, Washington artist Chris Pfeifle did an art installation using wooden crates. One hundred and seventy crates were used to create the art installation and the result is just as grand as Food Lifeline's mission. For more information on how you can help join the fight against hunger please visit www.foodlifeline.org. It’s that time of year again, and right now our large crate is a SPECIAL BUY at Home Depot’s summer storage event (http://thd.co/1OQmlcR). We're especially excited that this year our multipack crates are also a SPECIAL BUY online (http://thd.co/29a98gN), which is all the more reason to pack, store, and save! As part of this campaign, we teamed up with six amazingly talented DIY bloggers to create summer projects using our crates and pallet wood. Get a sneak peak of their projects below and visit their blogs for full project details and instructions. Your kids won’t have to look for towels or goggles again! Jamie Costiglio of www.thatsmyletter.com used four large crates to make up this storage tower. She disassembled and resized one of the large crates to fit into the bottom crate as a large drawer. If you decide to leave the crates natural, you will need to apply a waterproof seal (Try this one here: http://thd.co/298RDz4 ). 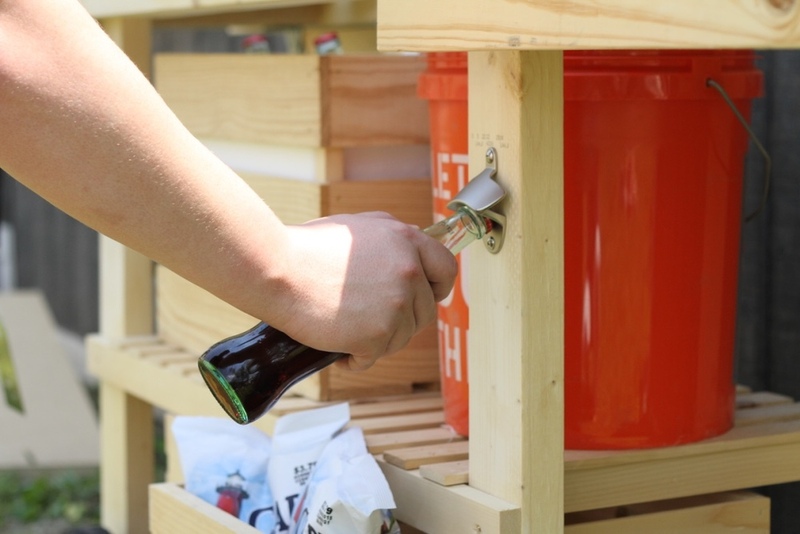 Or, if you choose to stain your crates, just use a polyurethane seal. You can also paint it any color to give it a protective seal. For full project details, visit Jaime's blog. Instantly warm up your home with reclaimed pallet wood. Jen Woodhouse of www.houseofwood.com built this beautiful bookshelf and wrapped it in our reclaimed pallet wood. She used the large and extra-large crate to fill it, making it decorative and functional. For full project details, visit Jen's blog. Amy Latta of www.oneartsymama.com used two large crates to make this outdoor table. She added a top and shelves for extra functionality. The table doubles as an organizational tool when you grill, and a knick-knack table for enjoying drinks with friends. For full project details, visit Amy's blog. This brightly colored picnic basket was created by Amber Kemp-Gerstel of www.damasklove.com. 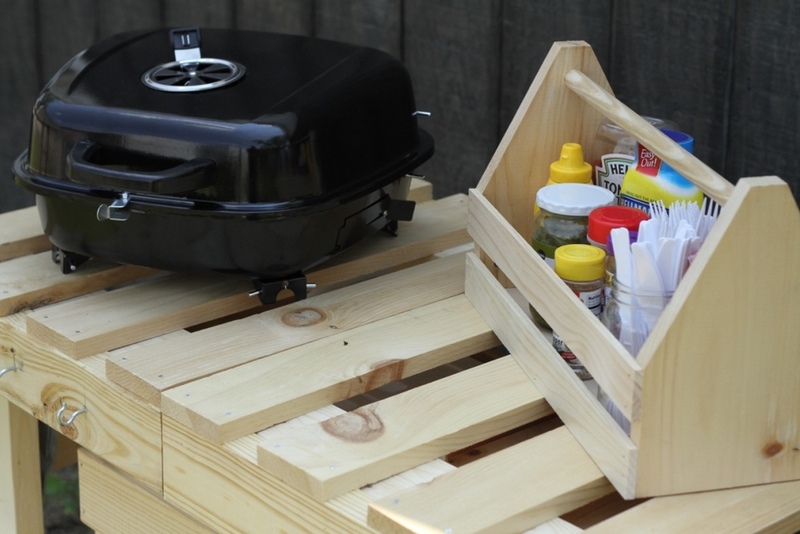 She used our large crate and built a lid that doubles as a table for enjoying summer picnics. Amber’s project won first place in Home & Family’s Ultimate DIY Star Competition! For full project details, visit Amber's blog. Why buy it when you can build it! Corey Decker of www.sawdust2stitches.com built this Pottery Barn inspired kids dresser using six large crates. 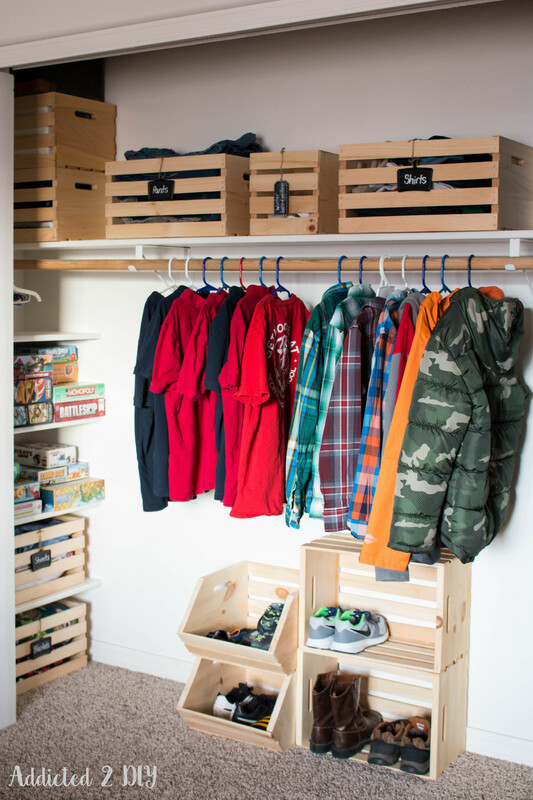 Stain the crates to match any child’s bedroom. For full project details, visit Corey's blog. Natalie of www.athomewithnatalie.com built this kids table out of two large crates. Using an old table top she had around the house, Natalie covered the top with our reclaimed pallet wood giving it a distressed look perfect for kids to use. For full project details, visit Natalie's blog. It's time to clear the clutter and step into the new year with an organized house! It's The Home Depot's annual Winter Storage event where our crates are a SPECIAL BUY from now until January 31st or while supplies last (click here). We teamed up with eight bloggers to bring you organizing ideas with our crates for some of the most high traffic places in your home - pantry, kitchen, and closet! See how each blogger utilized our crates to maximize space and clear out the clutter! Corey Decker from www.SawdustToStitches.com used small crates, vegetable crates, tall wall crates, half wall crates, and large crates to complete her free-standing pantry. There is a spot for just about anything in this piece, not to mention it's guaranteed to add a little charm to your kitchen. For original project instructions, click here. Amy Latta from www.OneArtsyMama.com used our divided crate for wine storage. As you can see a little paint and some awesome hand-lettering add that touch of charm to make this functional piece a great gift too! For more project details, visit her blog here. Maximize your space and have a place for everything with this rolling kitchen island! Mindi Carwin from www.MyLoveToCreate.com built this piece using large crates, small crates, vegetable crates, a half crate, tall wall crate, and a half wall crate. For original project instructions, click here. Jaime Costiglio from www.ThatsMyLetter.com built a shoe storage bench for all of her family's necessities using four large crates. It's the perfect spot to put on shoes and to keep belongings in one place. The best part about this simple bench is that you can customize the size to fit your needs. For original project instructions, click here. Katie Cleveland from www.Addicted2DIY.com labeled large crates, vegetable crates, and square crates to clean up her son's closet. A very simple task, yet one of the most effective in keeping belongings tidy! For original project instructions, click here. Amy Geib from www.AlwaysNeverDone.com built this toy storage bench using three large crates and three crate lids. Paint it or stain it to match any decor,and add cushions for extra seating. Store kids toy or dog toys to clear the clutter of your living room floor! For original project instructions, visit Amy's blog here. Brad Rodriguez from www.FixThisBuildThat.com organized this closet using our large crates. He mounted sliding drawers to the wall increasing his storage capacity and ease of getting into his belongings. For original project instructions, click here. Which room in your house do you need to clear the clutter? Be sure to VOTE for your favorite blogger project on RYOBI Nation by 1/31/16 - Bloggers have a chance to win a $750 RYOBI Prize Pack! Click here to VOTE! It's our Back to School Campaign and our crates are a special buy at all Home Depot stores right now until August 5th (or while supplies last). To coincide with the event, we decided to outfit an entire dorm room out of our crates and pallets! Our products alone, and with a total of 7 small crates, 21 large crates, and 2 half pallets, it cost approximately $353.46 to outfit the entire room. Now that's decorating on a budget! And, the best part about it all, is that having a dorm room made up of wooden crates makes for easy moving the next school year. We know you're smiling now, so keep reading to get a closer look at each area of the room and to find out how you can decorate your own room out of crates and pallets! A half pallet was used to create a headboard for the bed, and hooks were added to the side to hang headphones and phone cords. Adding caster to large crates makes for easy and accessible under the bed storage! Our crate desk fit perfectly into our Crates and Pallet dorm room. This just one of the many desk designs that you can build using crates. This on in particular is made using 8 large crates (desk frame) and 6 small crates (drawers)! If you haven't already, check out our Project Page for details on how to build the crate desk. We painted our half pallet with chalkboard paint to create a wall calendar above the desk. Adding hooks allows you to hang hats, keys, and more. We nailed together two large crates to create this bedside table and applied contact paper from The Home Depot to add a fun print inside. Our large crates also make great floating shelves above the bed. We made a sconce out of our small crate by drilling at 1" hole at one end of the crate and attaching a pendant kit. After attaching the kit, we were able to screw in a lightbulb, and voila - there was light! Finally, we made a leaning bookshelf by simply stacking 5 large crates in a ladder-like form. Two side panels with mitered ends raise the crates and allow them to lean against the wall. For project plans on the leaning bookshelf, visit our Project Page. So what do you think? See anything you think you or your kids could use in their room? Leave your comments and ideas below! Jaime Costiglio from That's My Letter made these beautiful farmhouse style locker cubbies using 6 large crates and 6 small crates. Locker cubbies are a great way to organize your family during the school year and even during the summer to store crafts, books, crayons, etc. This piece is so versatile and pretty to look at; you could even use it as a kitchen or dining room piece! For project details and build plans, visit Jaime's blog and read her post, here. Pauline Henderson from My Altered State created this modern mudroom look using five large crates and three small crates. 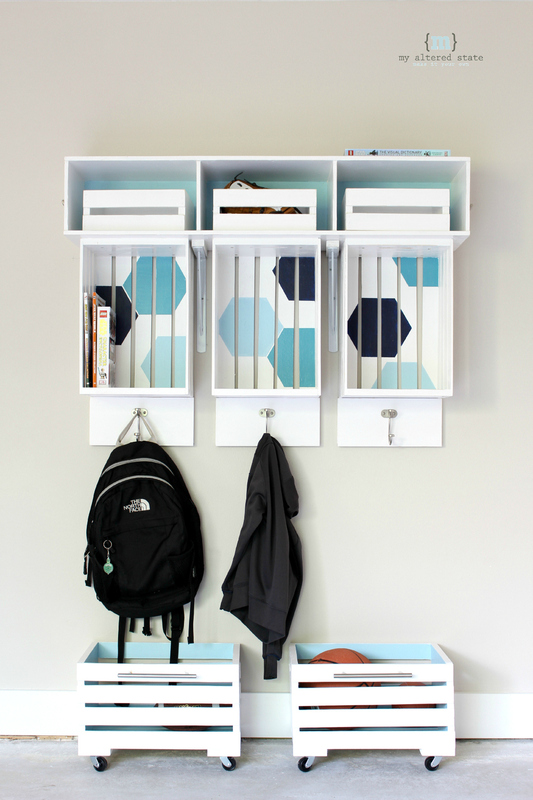 Kids and adults of all ages will stay organized with these cubbies where they can hang up backpacks and jackets, store boots, and sports equipment. What makes this mudroom so great is that you can put it anywhere - closet, garage, laundry room, etc. the possibilities are endless! You can read her blog post on this project, here. Maryann Caballero from Domestically Speaking designed this garage organization unit pictured above. 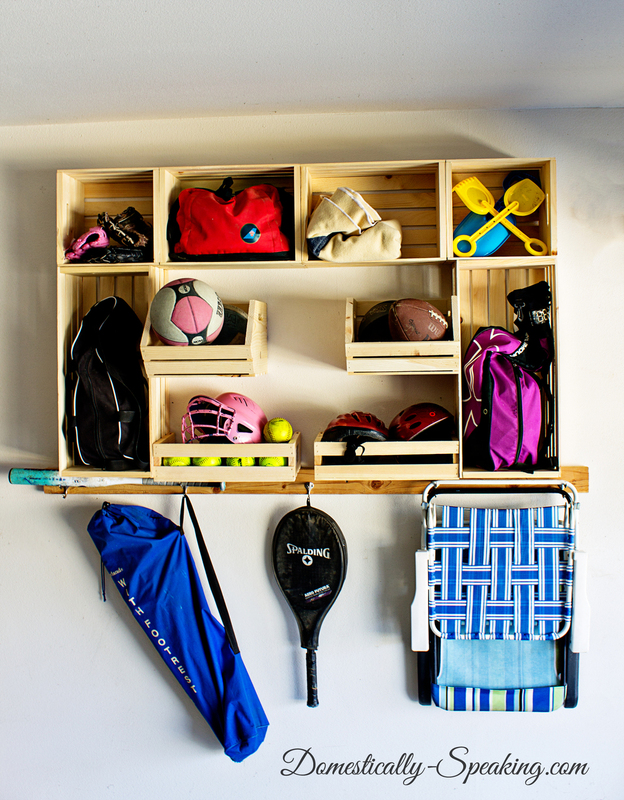 The project is the perfect solution to keeping your garage organized throughout the year. Everything from beach chairs to tennis rackets have their own place in the puzzle keeping clutter off of the floor! Maryanne used two large crates, two medium crates, two extra large crates, two half wall crates, and two vegetable crates to complete this project. Check out project details, here! Melaine Thompson from My Sweet Savannah created this stylish stackable storage unit. 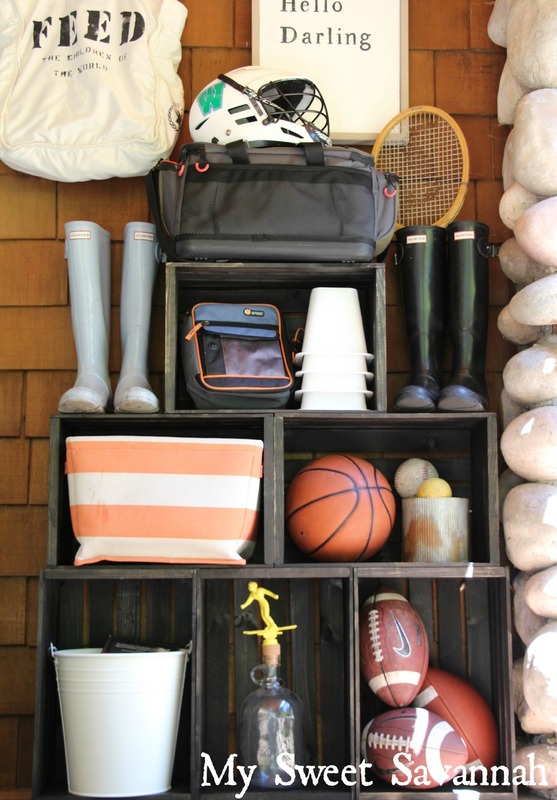 What's great about crates is that you can stack them anyway you want, which is why this storage unit is great for a mixture of sports equipment, boots, totes, awards, and so much more. Melanie used six large crates to create this functional and economical way to store all your families outdoor gear year-round. For more details on this project, visit Melaine's blog and read her post, here. Last but not least, we joined in on the fun and created this Crate Desk out of eight large crates and six small crates used for drawers. 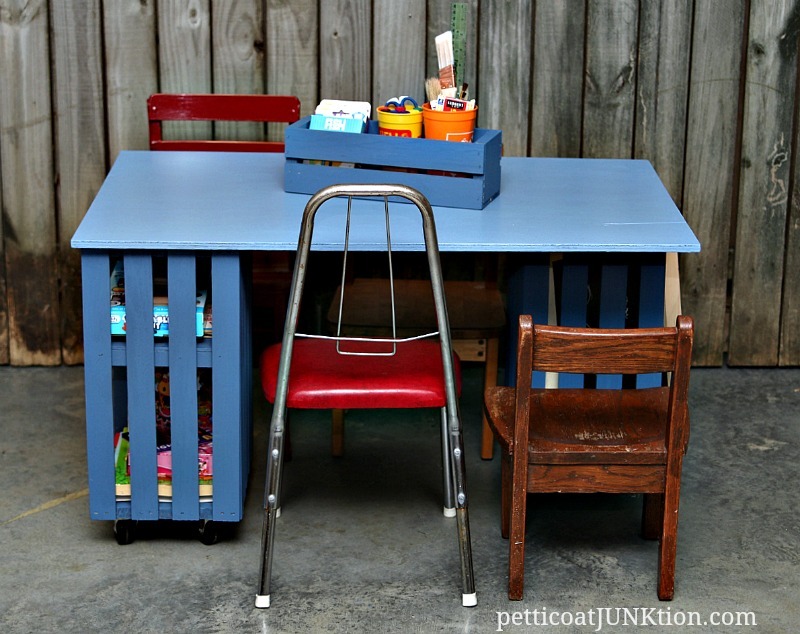 Students of all ages can do their homework on this fun and thrifty desk. The easy design is one of several you can create using crates. Adults can use it in their office or it can be used as a crafting desk. Dress up the drawers with cool handles, and paint or stain it to match any decor. For project instructions on the Crates and Pallet Crate Desk visit our Project Page. 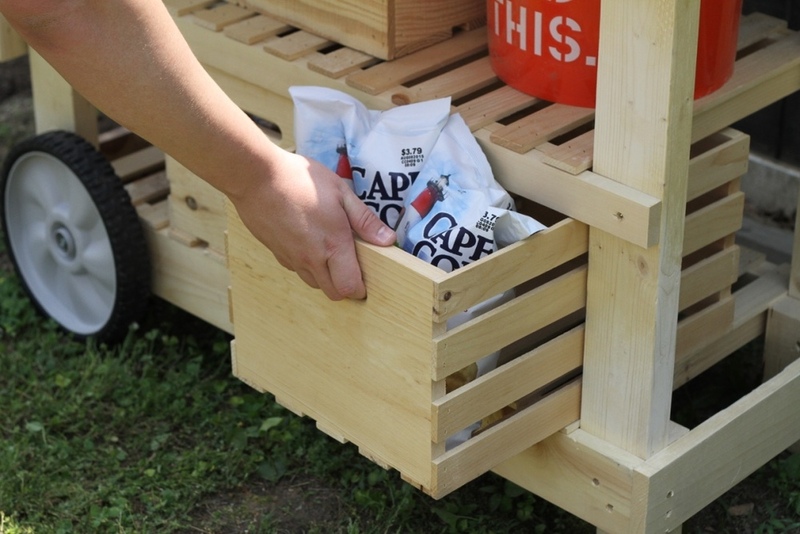 You can find our small and large crates at The Home Depot stores to get started on your Back to School Project. You can always find all of our different sized crates online, here: http://thd.co/1AjStQP. Stay tuned for more Back to School themed projects coming later in July! Which project is the best organization solution for your family? Let us know in the comment section below! Memorial day Weekend is here and we built this Party Station just in time! If you're anything like us, you'll be spending your weekend outside with family and friends while honoring the memories of those men and women who died fighting for our freedom. The Party Station is the perfect addition for your backyard BBQs and summer parties. You can build your own Party Station for a chance to win $1000 in RYOBI power tools! Be sure to check out RYOBI Nation and our Project Page for build plans and instructions. 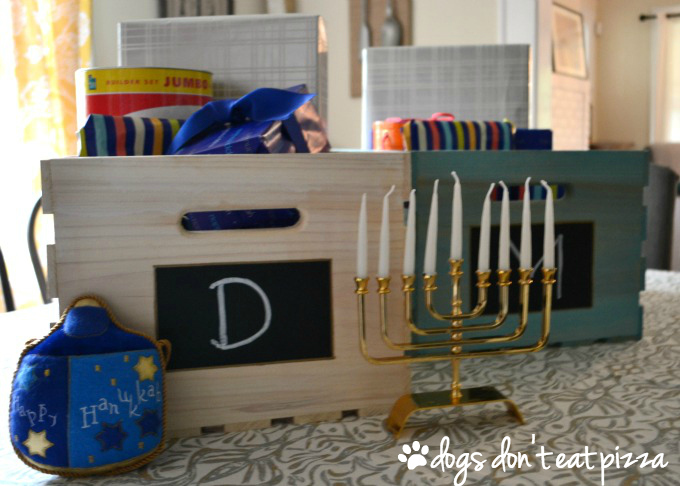 Our Party Station is a great project for the beginner/intermediate DIYer! We've provided you with detailed instructions on our Project Page but here is a basic breakdown of the project. We built a frame for the cart and incorporated a variety of our products to finish it off. The sliding counter is made from two quarter pallets. We added a folding shelf for the pallets to rest on when the counter is open. We used our large crate for easy storage drawers. Additionally, our wood slatted shelves are actually three crate lids that fit snugly with the frame! And, to top it off we added a bottle opener and hooks to hold our grill utensils. We also used our medium crate as a cooler and toolbox as our condiments caddy. We had great time building our Party Station. Be sure to tag us when you post your version. We can't wait to see them! Check out our Project Page for detailed plans and instructions.